The surveillance state, exposed through brave whistleblowers such as Edward Snowden, has come under immense criticism. But government officials have latched onto the Paris attacks in their propaganda campaign. On Monday, CIA director John Brennan criticized new privacy protections, claiming that they are hampering government’s ability to find the terrorists. He also continued the push for law enforcement to get “backdoor” access to everyone’s encrypted smartphones. The message was delivered at the Center for Strategic and International Studies, after a video surfaced of what appears to be ISIS fighters threatening to kill Americans and Europeans. The video proved to be quite useful for Brennan’s fear campaign. “They have gone to school on what it is that they need to do to in order to keep their activities concealed from the authorities,” he said of the terrorists’ purported advanced capabilities. What Brennan means by “concealed from the authorities” is nothing more than privacy, guaranteed under the fourth amendment of the Constitution. Because a terrorist can hide things from the government, in Brennan’s eyes, no one should be able to hide things from the government. No evidence has been offered to support the claim that the Paris attackers used encrypted communication. Nonetheless, the attack will be used by authorities to counter not only privacy concerns but security concerns. Technology experts have warned that mandating “backdoors” into everyone’s encrypted devices will erode internet security and make it easy for hackers to carry out identity theft. Several mouthpieces of the propaganda machine have also paraded across MSM channels, and their favorite target is Edward Snowden. 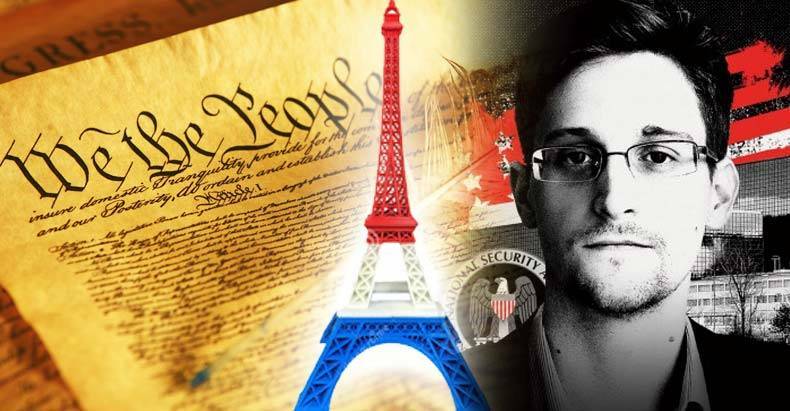 Former CIA director James Woolsey said on MSNBC that Snowden has “blood on his hands” for the Paris attacks. Hacks at the National Counterterrorism Center are echoing the claim that exposure of intelligence collection techniques allowed this act of terrorism. However, Glenn Greenwald provided a simple rebuttal to these red herrings. “One key premise here seems to be that prior to the Snowden reporting, The Terrorists helpfully and stupidly used telephones and unencrypted emails to plot, so Western governments were able to track their plotting and disrupt at least large-scale attacks. That would come as a massive surprise to the victims of the attacks of 2002 in Bali, 2004 in Madrid, 2005 in London, 2008 in Mumbai, and April 2013 at the Boston Marathon. How did the multiple perpetrators of those well-coordinated attacks — all of which were carried out prior to Snowden’s June 2013 revelations — hide their communications from detection? Greenwald goes on to say how blaming Snowden is a desperate attempt to shift blame for the terror attacks onto whistleblowers, journalists and encryption technology. Even more worrisome than the inability of government to recognize its own mistakes is the incessant drive to cement the surveillance-military state onto the fabric of modern life – further criminalizing the behavior of innocent citizens.